Two possible lessons to be learned here: Either you should not underestimate Wikipedia, or, if you do, you should do so quickly because its failings may be soon edited into nonexistence. One or possibly both of these get to be the moral of story that began with my visit to the Wikipedia page on the children’s board game Hungry Hungry Hippos. Go there now, if you like, but you won’t find anything all that strange — aside from, perhaps, the information that all four hippos have names and that, in some versions, the purple hippo is replaced with a fifth, pink hippo. But that that little factoid appears on the page really shouldn’t surprise anyone who has ever had reason to look up a toy or TV show or song that he or she enjoyed in their youth. Tactics for the game vary by players but these are some of the most common strategies. Mashing: when a player constantly hits the lever to scoop up as many balls as he can. Commonly used by younger children. Sniping: when a player stalks a ball and waits until it is in his range to hit the lever and scoop it up. Cheating: when a player does anything not explained in the rulebook; i.e. harming another player, harming the gameboard or picking up the balls with his hands. Yes, it’s the third tactic that I mean to draw your attention toward. If it’s not enough that the person who wrote this would have not only done so without questioning whether cheating constituted a tactic, this person’s concept of cheating also includes physically harming other players or damaging the equipment used to play the game itself. 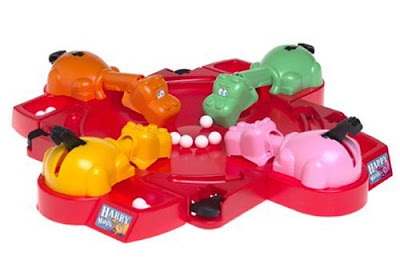 Which makes me thing my own Hungry Hungry Hippos days were rather tame. And, also, that I’m happy I didn’t every play it with this particular Wikipedia user.